The alternative title for this post should be Pattern Review: Burda 7443/Pattern Review: Burda 7057. It’s been so long since I’ve done a pattern review I’ve almost forgotten how to do them! It’s been nice using TNT patterns to make things this year, but I’ve missed testing out new patterns. It’s something I want to change over the next few months. When I was first asked to make the dirndls for Oktoberfest, I had intended to use patterns from my magazine stash, but after seeing example images and discussing possible styles with my clients, it was obviously going to be much easier to use Burda’s envelope patterns, although I did end up using a top from one of my older magazines. and the apron and skirt for the second. 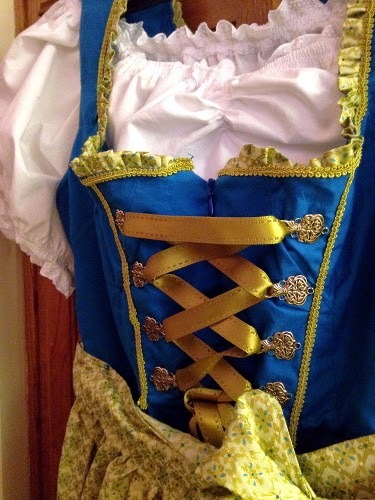 I used the bodice from this pattern for the second dirndl. BWOF-09-2006-131. 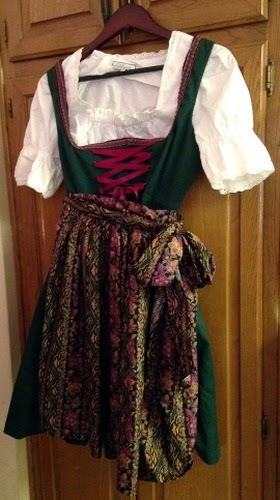 I altered the top to be used with the first dirndl. 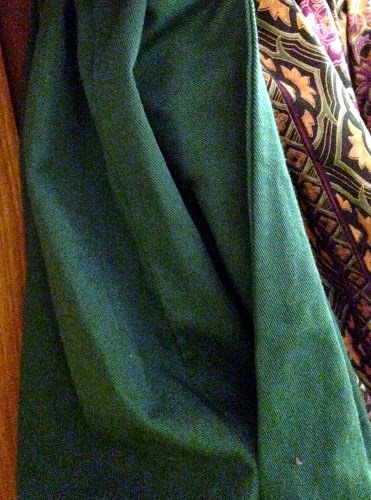 Dirndl #1 – Teal and Lime Green! I used the apron fabric as a ruffle trim around the bodice. though I did alter it to add gathering in the front. closure to a traditional garment. I love the lace hooks! I bought them from Renaissance Fabrics. 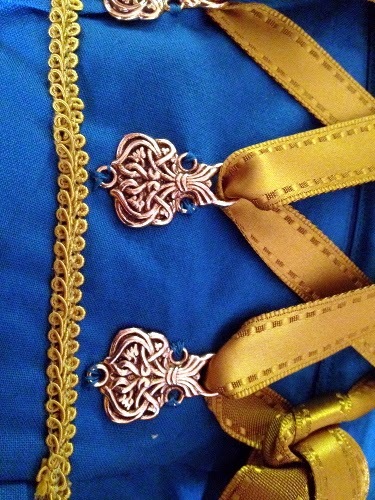 but I added the lace and braid as additional decoration. it’s a secure place to keep money, phones, and keys. It turned out so cute – both my client and I loved it! Pattern Description: Dirndl folk costume with blouse, dress, and apron. I made the dress and apron. Pattern Sizing: Burda sizes 36-50 (US sizes 10-24). Were the instructions easy to follow: Yes, I think so. I find the Burda envelope instructions to typically be much clearer than the magazine instructions, especially since they include diagrams for most steps. Did it look like the photo/drawing when you were done with it? Mostly, though I did make a few alterations. My client wanted wider straps, and I used a blouse from a different pattern. 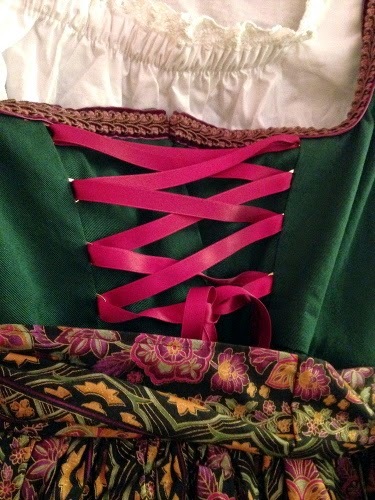 I also used different trim/lacing style on the bodice and apron than is shown on the photo, but for the most part it looks very much like the line drawing. What did you particularly like/dislike about the pattern: Likes: it looks like a traditional style, but is updated for a more modern fit, with modern closures. I liked that this pattern had a lot of seaming in the bodice (easy to adjust the fit), and I thought the instructions were quite good. Dislikes: none. Fabric used: Cotton broadcloth and quilting cotton print, hooks, ribbon, and lace trims. Pattern alterations or design changes you made: I added width to the straps and changed their shape as requested by my client. 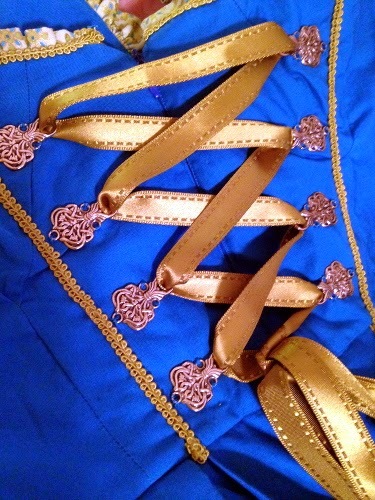 I made various alterations for fit, and changed the style of the trim on the bodice and apron. I also added a zipper pocket to the side-front of the skirt, which was hidden by the apron, but easy to access as storage for money, phone, keys, and whatever else. Would you sew this again? Would you recommend it to others? I might sew this again, oddly enough. The finished outfit looks awesome, and now at least three other people (including myself) are making noises about wanting one. I really liked the way this turned out, but I have a lot of pattern options at this point, so I may always end up making a different pattern too. 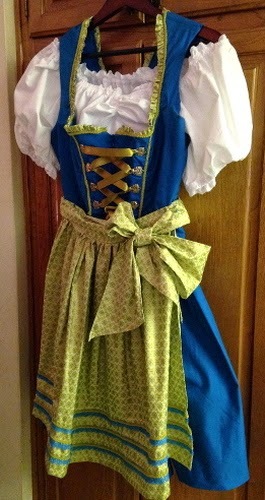 I would highly recommend this pattern to anyone looking to make a dirndl though – this turned out super cute! Conclusion: Love this pattern! It was simple to make, and turned out really cute. 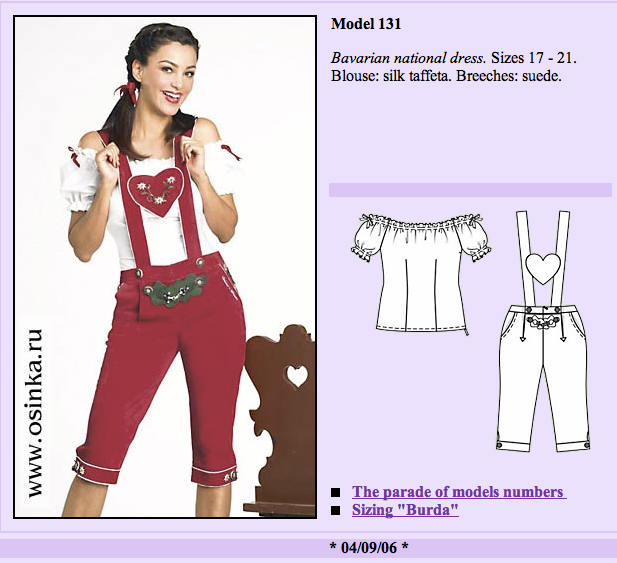 Pattern Description: Dirndl folk costume with blouse and breeches. I made an altered version of the blouse. Pattern Sizing: Burda sizes 17-21. Were the instructions easy to follow: Honestly I didn’t look at them at all. It was a very simple blouse to construct. Did it look like the photo/drawing when you were done with it? Sort of? I cut it shorter, since it was going under a dress, and those blouses all seem to stop below the bust. I also gathered the front to give it a mini sweetheart effect. Otherwise it looked very similar. 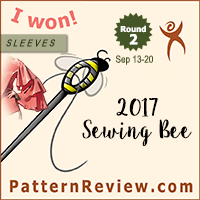 What did you particularly like/dislike about the pattern: Likes: It had the off-the-shoulder effect my client wanted, but with the elastic, it was sort of convertible to cover her shoulders as well. Dislikes: none. 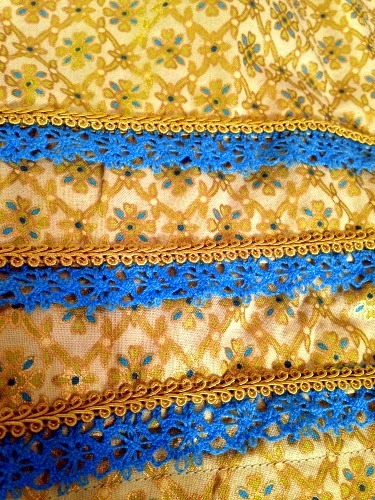 Fabric used: Cotton, elastic, and cotton lace trim. Pattern alterations or design changes you made: See the photo/drawing question. Would you sew this again? Would you recommend it to others? 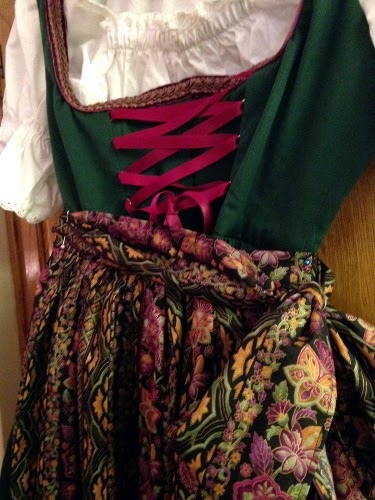 I might sew this again, if someone wanted an off-the shoulder dirndl top. I would recommend if you like the style. Conclusion: Good pattern. It was simple to make, and turned out really cute with the whole outfit. 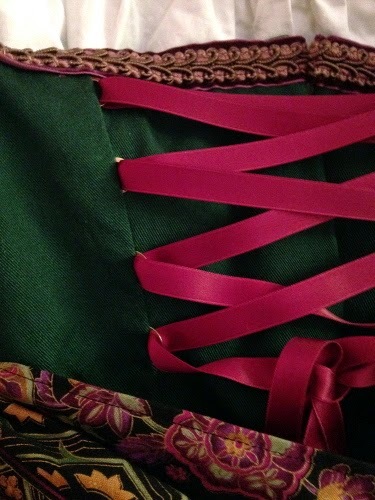 Dirndl #2 – Forrest Green and Plum! and subdued in colors and style. as she wanted to just use the traditional lacing closure. Instead, I put a panel behind the front bodice, so it won’t show how open or closed the front is. She used more basic lacing hoops, which I stitched into the seams. Also, I love the trip she chose to go around the bodice! 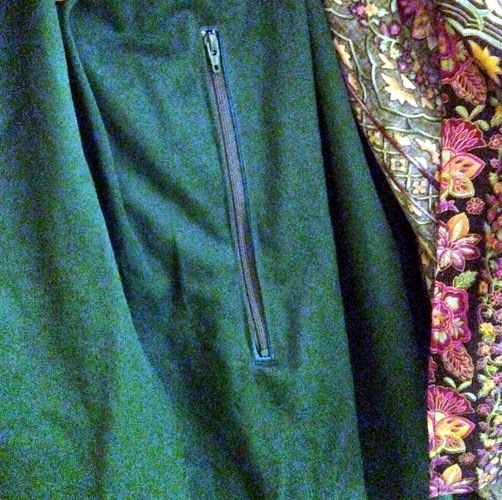 … as well as the hidden zipper pocket under the apron. Pattern Description: Dirndl folk costume with blouse, dress, and apron. I used the bodice from the dress portion. Pattern Sizing: Burda sizes 32-46 (US sizes 6-20). Were the instructions easy to follow: Because this was the second dirndl I made in the span of about a week I didn’t actually open them. I sort of looked at the instructions from my other pattern (Burda 7443), but mostly sewed without them. Did it look like the photo/drawing when you were done with it? Sort of, though this was really a frankenpattern project if there ever was one. The top was pre-purchased, the bodice was from Burda 7057, the skirt was from Burda 7443 (although here I gathered it, rather than pleating it as instructed in that pattern), the apron was a mix of self-drafted and pattern pieces from Burda 7443, and the pocket bags were from Vogue 8727. 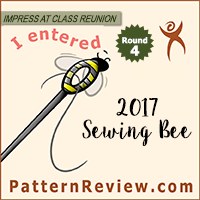 What did you particularly like/dislike about the pattern: Likes: it has a very traditional style bodice that was easy to alter and embellish to my client’s specifications. Dislikes: The skirt uses A LOT of fabric, so I had to use the skirt from a different pattern, due to fabric shortage. Fabric used: Cotton twill, quilting cotton print, hooks, ribbon, and braid trims. Pattern alterations or design changes you made: Aside from mixing a million different pattern pieces (see above), my client also wanted a more traditional closure (ie, not a zipper), so I had to add a modesty panel behind the front bodice, so skin wouldn’t show when the top was laced closed. 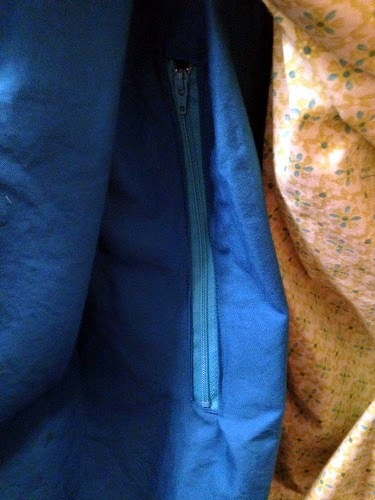 She also wanted a lot of pockets, so I added two in the side seams, and a zipper pocket that is hidden by the apron. Would you sew this again? Would you recommend it to others? I would consider sewing this again if I needed to make another dirndl. I would be fun to use the skirt pattern and make something a bit more voluminous if I had the fabric in the future as well. I would highly recommend this pattern to someone wanting to make a dirndl, but I would caution that this pattern uses more fabric than many of the other options from Burda. Conclusion: The part of this pattern that I did use was great! I was able to achieve a look very similar to the pattern envelope, but also alter it enough to fit the fabric constraints, budget, and desires of my client. Whew! And I’m done. Sorry it took me so long to blog – these were finished more than a little while ago, but I’ve been quite lazy about posting pictures. In any case this was a really fun project – I got to make something unusual, pretty, and interesting. It was nice working with something that didn’t include rhinestones and spandex too. I don’t know if I’m going to go into dirndl making full-time (as people keep teasing me about it), but I wouldn’t mine doing other non-skating projects in the future. In the meantime, I’ve got several practice costumes and a reunion dress to make. WoW! These are exquisite! Lovely work. Beautiful work, you should be very pleased with them. I'm guessing the clients are happy too. 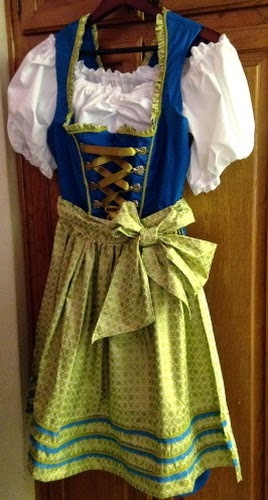 I doubt I will ever make a dirndl (though if I do I have about 10 years of Burda versions! ), but these both look really good and you can see the amount of work you put into them. The hidden zip pocket is brilliant.